Koalas (Phascolarctos cinereus) are Australian marsupials that, while not technically bears in any way, are often referred to as them because of their furry and round physical appearances. These mostly nocturnal tree inhabitants are a relatively common sight Down Under, where they often reside in eucalyptus forests, on farming sites and in woodlands. Koalas' bodies can grow as long as 31 inches, according to the World Association of Zoos and Aquariums. Weight-wise, fully mature koalas can be as heavy as 33 pounds. Koalas that reside in southern regions of Australia are usually a little bigger than their northern counterparts, however. Male koalas, across the board, are significantly larger than the females, as well. They also have much bigger heads than the females. A koala's fur has a deceptive appearance. Though it may look smooth to the eye, it actually has a rather coarse texture. Koala fur usually is brownish or gray, although southern specimens are markedly browner than those in the north. They also have white fur on certain parts of their bodies -- think the chest, ears, neck and legs. Koalas of the South also tend to have longer fur. As marsupials, koalas naturally possess pouches, which they utilize for nursing and nurturing their young offspring. 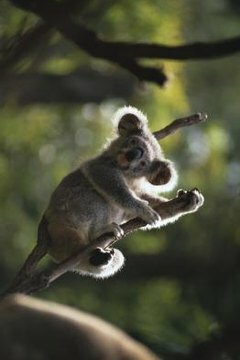 Koala pouches face their back legs, unlike those of some other varieties of marsupials. They contain a pair of teats. Only the females of the species have pouches. Koalas have an array of physical features that help to make them easily identifiable. These include their sizable and circular ears, big paws, prominent noses, small eyes and tiny, barely visible tail "stumps." Their feet and hands are clawed. Koalas' feet are rugged and uneven on the bottom, which helps them during their frequent tree climbing efforts. Baby koalas, or "joeys," start their lives totally free of fur. They actually don't develop any hair for approximately six months. Not only do newborn joeys not have any fur, they do not have any vision either. Joeys are not sophisticated at birth, although they do spend well over half a year tucked inside of their mothers' pouches, nursing and growing steadily. The little guys are tiny at birth -- usually between .015 and .035 ounces, indicates the San Diego Zoo.